The living room of your Naples-area home is one of the more public rooms in your home. Like the kitchen, it’s where family, friends and guests gather to socialize. It’s no wonder living room remodeling projects are some of the more popular remodeling projects homeowners take on. But what matters most in your Naples living room? The answer to that question depends on how you define a living room. There are traditional living rooms that are a bit formal and set off by themselves to create a quiet, comfortable place for people to engage in conversation. There are also family rooms that tend to be a bit more casual—both in terms of design and furnishings. For a lot of homeowners, the family room is synonymous with the entertainment room. It’s a fun area for talk, games and perhaps watching movies or television. And there are also family rooms/living rooms that are part of a great-room concept. They may be open to the kitchen and or the dining room to create a large open space that serves multiple purposes. It doesn’t matter what you call this space, but before you get too far into planning the design, layout and furnishing of your living room, it’s good to do a mental check and think about how you plan to use that space. What’s your entertaining style? Is it casual or a bit more formal? What kind of activities will you engage in while in this room? What kind of feeling are you after? Do you want a spacious, open area, or are you after a cozier feel? How important is it that you have easy access to the kitchen? How will your living room fit into the flow of the rest of the home? 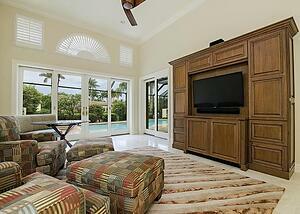 If you look at the image above, you’ll see that this particular living room is also an egress to the pool area. That has an effect on the layout and the style of the room. Once you decide how you plan to use your living room, the next step is to sit down with a designer to map out exactly how to get the most out of your “new” room. Our award-winning design team has years of experience turning ideas into beautiful, practical realities. Not only can the team help you by bringing you up to speed on the latest trends and ideas,but they can also help you evaluate that information and make the decisions that are right for you. After all, what matters most in your Naples living room is what’s makes it feel like home to you, your family and your guests!